The "What is Foreclosed?" Forum was held last Saturday at Columbia's Low Library. It might have been the first time that the works of Jay-Z, Malice, and Nas were evoked under the great dome of Columbia’s Low Library, but given the trend among young academics to cite rap alongside Socrates, it’s probably won’t be the last. That the quotes were used in the panel discussion called “Suburbs, Cities and Crisis,” spoke to a slightly skewed perspective of discussing the suburbs within the confines of Manhattan. 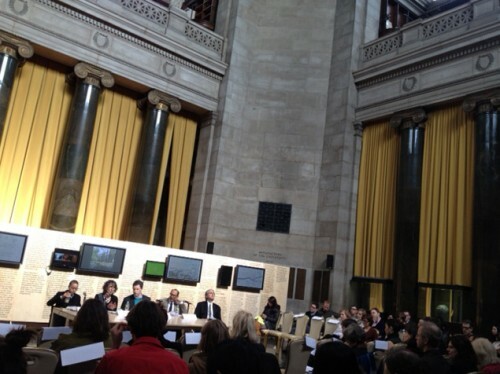 The panel discussion was held last Saturday by GSAPP and Temple Hoyne Buell Center to compliment the the Foreclosed exhibit at MoMA. CUNY’s Setha Low was joined by Robert Fishman of University of Michigan, Superfront’s Mitch McEwen, and Newark’s Urban Design Chief Damon Rich. McEwen compared Jay-Z’s “exalted freedom” within housing projects to that of Nas’s lack of hope impressions. Given the content, it might seem safe to believe McEwen was referring to conditions in the inner city, but she pointed out that the “suburb as ghetto” isn’t that far from current reality. She noted Parisian suburbs are experiencing the trend, but so are the Oranges of New Jersey. The show at MoMA responds to demographic and economic trends that were exacerbated by the foreclosure crisis. “Architects are repositioning to undo this violent work that we as architects and planners have undertaken,” said Rich. “The built environment helped create the crisis.” Rich also addressed criticism that Forclosed show was too theoretical. “It takes a theory to makes something happen,” he said. Later when the discussion opened to the floor, the general consensus was that theoretical work done at the architecture school often gets dismissed by the schools of economics, business and international studies—the very audiences architects need to engage. “How do we hitch them so that we do connect reality to theory,” he asked. “If the folks in development told us what research to do we wouldn’t have parametrics,” quipped McEwen. Fishman said that perhaps developers should have paid more attention to work coming out of architecture schools. “The economics didn’t take into consideration that the demographic movement was going back to the core,” he said. He added that the subdivisions promoted sprawl, and while they may have been cheap to build, developers never factored in eventual transportation costs. Quite often when developers do consider design a factor it’s not always top notch. He cited advertising for Toll Brothers that trumpet “award winning design” but never tell you what award they won. Low encouraged the theoretical approach provided it kept in mind “the people holding the bag” of the foreclosure crisis. “There’s a material reality that ripped us apart,” she said.